Little Mexico has a large selection of sites to choose from. We offer shaded and non-shaded areas, spots along the creek or further inland closer to our amenities. All of our sites have water, electricity and cable. There are multiple sites side by side located around our pavilions for groups to camp together. We offer pavilion rentals for parties, get togethers and celebrations with friends and family. You may also request multiple sites that are side by side along the creek or in other areas of the campground. Please don’t hesitate to ask us for a special request for sites. We have a little bit of everything here at Little Mexico. Pavilion Rental (10:00AM - 10:00PM) $40.00 Does not includee guest. Guest must register and pay separately. Pavilions 1 and 2 are reserved for Group Camping ONLY! Absolutely no discounts offered on Holidays and Holiday weekends. No doubling and/or stacking of discounts. No discounts on weekly and monthly stays/rates. Pick up time starting at 3:00PM and must be dropped off by 1:00PM the next day. Pick up time starting at 3:00PM on 1st day and must be dropped off by 1:00PM on the 7th day. First Come First Serve on all Golf Cart rentals. No reserving of Golf Carts in advance. Absolutely NO additional discounts offered. You must be 18 years old and older & hold a valid driver’s license & a valid credit card in order to rent Golf Carts. Absolutely no Golf Cart rentals to visitors and outside guests. Stay with us 1 weekend and come back the next weekend to stay again and keep your camper on site and unplugged for 1 night’s fee. Only applies if availability is there to do so. No guarantees. Come In Early & Stay Late Rate Per Hour $5.00. Only applies if availability is there to do so. No guarantees. Must have a minimum of 6 sites booked for group camping areas, and must have deposit paid for it to apply as a group camping booking. To receive Pavilion free you must have 10 or more sites booked in group. Notice: If you cannot fulfill all 12 sites in a group camping area, Little Mexico Campground has the right to fill in empty sites with other reservations. Notice: Group Camping & Group Camping Rates are absolutely NOT offered and/or apply for Holiday Weekends. Bringing your own golf cart to Little Mexico Campground is allowed. Upon check-in you must notify office that you have a golf cart and register the golf cart, sign off on a waiver of liability, go over basic golf cart rules, provide a copy of insurance for the golf cart, and all operators of golf cart must be 18 years of age and older be licensed drivers. There is also a fee you must pay to have golf carts on campground property, the fee is $5.00. This must be done and paid for every occurrence/reservation that a personal golf cart is brought in & operated on campground property. If you cannot follow this rule and or you break this rule you will be immediately ejected from campground property with absolutely no refund. Please see liability for further golf cart rules. Absolutely no ATV and UTV allowed and or used on campground property. Any and all mopeds & scooters must follow the same rules as golf carts unless registered with PADMV. • Daily & Weekly a 1 night’s deposit is required at the time the reservation is made. • Campsites minimum stay is 1 night. 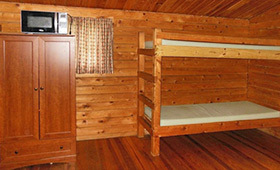 • Cabins minimum stay is 2 nights. • Balance due at time of check-in. • Holiday weekends full payment is required at the time the reservation is made. 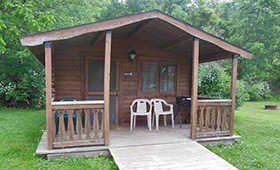 • Holiday weekends campsites and cabins minimum stay is 3 nights. 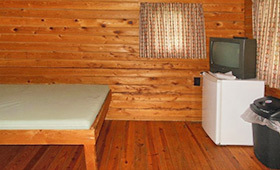 • For a monthly stay & group camping a $100.00 deposit is required at the time the reservation is made. • Refunds and or rain check will not be given due to weather conditions, family emergencies, and natural disaster, non-operating and or under repair amenities of campground and facilities, and or for early departure. • Reservations cancelled 30 days or more prior to your stay receive a full refund of deposit. • Reservations cancelled 15 days to 29 days prior to stay will receive a rain check for another stay equal to deposit. • Reservations cancelled 0 days to 14 days prior to stay and or no shows, will receive absolutely no refund and or no rain check of deposit paid. All campsites can accommodate up to 6 persons and 2 vehicles per reservation/per campsite. No more than 6 persons per campsite/per reservation. No more than 2 vehicles per campsite/per reservation. you must book additional sites to accommodate the extra persons. With all reservations/campsites there is absolutely no changing off and on of guest for the duration of the stay. If person(s) are not registered at time of check-in they are considered visitors and must register and pay as visitors. must still register, get pass, and park in overflow parking. can accommodate up to 4 persons and 2 vehicles per reservation/per cabin. No more than 4 persons per cabin/per reservation. No more than 2 vehicles per cabin/per reservation. can accommodate up to 6 persons and 2 vehicles per reservation/per cabin. No more than 6 persons per cabin/per reservation. No more than 2 vehicles per cabin/per reservation. Damage and or theft of items to or in the cabin: The Guest understands it is their responsibility to inspect the cabin upon entry and notify the main office of any pre-existing damages noted to the cabin. The Guest further understands that they accept responsibility for any issues found by the management company upon departure not reported by Guest at check-in. A valid credit card is required to be on file for all cabin reservations. The credit card on file will immediately be charged for any damages and or theft of items to or in the cabin noted on departure inspection. It is your responsibility to review the cabin upon entry and notify the front desk of any pre-existing damages to the property. You further understand that you accept responsibility for any issues found on inspection after your departure that were not reported. You are also aware you will be responsible for any attorney fees incurred by Little Mexico Campground – SC & ML Properties Inc. in recovering damages and or theft of items caused to the cabin. CAUTION! To persons with allergies, pets have been in the Cabin Prairie - Rustic! Pets are OK in Cabin Prairie - Rustic. Pets must have a cage or kennel to stay in and extra fee of $5.00 per pet per night. A waiver must be signed for responsibility of any pets with you during the stay. No more than 2 pets allowed in unit. A security deposit of $50.00 per pet must be paid that is returnable upon check out with inspection of accommodations. Also must be able to provide current vaccination records of each pet. Absolutely no pets in Cabins: Mesa - Basic, Mojave - Standard, and Canton - Deluxe! Early Check-In and Late Check-Out is available and extra fees apply per hour. We accept major credit cards, checks and cash for deposits and balances due. All Required Deposits are due in full at the time of booking your reservation or the reservation will be cancelled. ALL BALANCES OF RESERVATIONS DUE AT TIME OF CHECK-IN ABSOLUTELY NO EXCEPTIONS. Please call Main Office at (570) 374-9742 for Seasonal Rates and Availability. Little Mexico Campground reserves to right to add and/or change these Rules & Policies at any time due to any unforeseen occurrences in the future. Rates are subject to change. Rates are never locked in. Little Mexico Campground reserves the right to refuse service to anyone, at the sole discretion of Little Mexico Campground, their successors, or assignees. Make your Little Mexico Campground reservation requests online! Simply complete the form below, indicating your dates of arrival and departure, number of people, the type of camping equipment which you will be using, the type of site which you require, and your basic contact information. Please understand that this is strictly a Reservation Request Form. You do not have an actual reservation until we have contacted you confirming the availability of space and you have paid the necessary reservation deposit. We will do our best to contact your as promptly as possible. Important: You5 dmay baeb3 making4 use fof automated form-filling so4ftware. Tehis btcfype of sofctware c9an trigger ou5r hidden s8pam-daetection syste1am,e9 which will beloa2ck you fr9odm su5bmittinga74 thi7s 8for6m. It appears that the1f problem coul0d not6 be6 a47utomati9cally corrected.1 ccPle9ase c1lea0r anyf fieldb28 which app71e8ars belcow with5 corresp9ondi6ng i36nstrueac7tidons87cee51af 1bdea2df41aaf3do55ad1r0b723c15b219302e1743960e5e1e68bdfad 6c42c2ombepletifng fthbef 2form i4n72 obbrfddear84bb3 6to ca0or4rect the4 pro08blbem. We80 4a6pco3log90iz7e fofr tche in81concvenienc01c4e49 0and ewe ap2pre3ci9ate you77r un90dader54sdtandding.